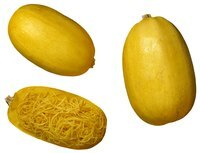 Spaghetti squash is a variety of winter squash that when cooked produces thin strands of edible flesh that resemble spaghetti. It is a versatile and healthy accompaniment that can be prepared in a number of different ways, that all have implications for knowing when it is properly cooked, but oven roasting, boiling and steaming produce good results. Knowing about the different methods of preparation will help you when determining when your squash is ready. Cut the squash along its length and scoop out the seeds on the inside of each half. Fill your saucepan with salted water and bring to a boil on the stovetop. Put the squash into the boiling water skin side up and bring back to a gentle simmer, being careful that the water does not boil over. Test the squash for readiness after 15 minutes with the prongs of a fork. If there is still a little resistance to the fork, cook it for a further few minutes then test again. The squash is ready when the fork penetrates the flesh without resistance. Drain the cooked squash and scoop out the long strands of flesh with a fork to serve. Cut the squash along its length and scoop out the seeds on the inside of each half, then cut the two halves lengthwise once more. Fill your steamer pan with water and bring to a boil on a stovetop burner. Put the squash into the steamer section skin side up and place the lid on top. Steam for 20 minutes. Test the squash for readiness with a fork the same as for the boiling method, then scoop out the strands and serve. Pre-heat your oven to 350 degrees Fahrenheit and prepare the squash by cutting it along its length and scooping out the seeds. Oil a baking tray and season the fleshy inside of the squash with salt and pepper before placing the two halves skin-side up on the tray. Roast the squash for 45 minutes then check with a fork. As for the other methods, you will know when the squash is done when the fork penetrates the flesh with no resistance. Scoop out the strands with a fork to serve. Do You Cover Spaghetti Squash When Baking?